1 of 6 Heat oven to 350 degrees . Butter the bottom of a 10-inch round cake pan with 4 tbsp of the butter. Sprinkle with 1/2 cup of the brown sugar and the sea salt. 2 of 6 Heat remaining 2 tbsp cold butter in a large skillet over medium heat. Add apples; saute 13 to 15 minutes, until tender. Cool. 3 of 6 In a large bowl, whisk flour, pumpkin pie spice, baking powder and salt. In a second large bowl, beat softened butter and remaining 1 cup brown sugar until smooth. Beat in eggs, one at a time, then vanilla. On low speed, beat flour mixture into butter mixture, alternating with half-and-half. Scrape down sides of bowl; beat for 1 minute. 4 of 6 Fan apples over bottom of prepared pan. Spread batter over apples. Bake at 350 degrees for 45 to 50 minutes, until a toothpick inserted in center comes out clean. Cool for 15 minutes. 5 of 6 Run a small knife around edge of pan. Place a serving plate on top of pan and turn plate and pan over together. Carefully remove pan. 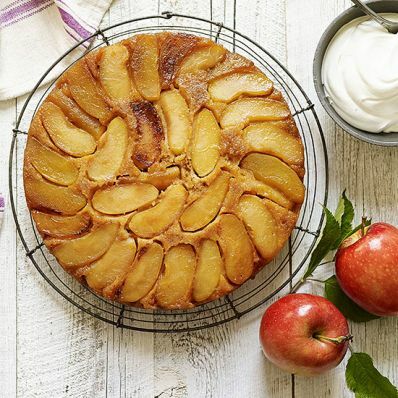 If any apples remain in pan, place on cake. 6 of 6 Serve warm or at room temperature with whipped cream, if desired.